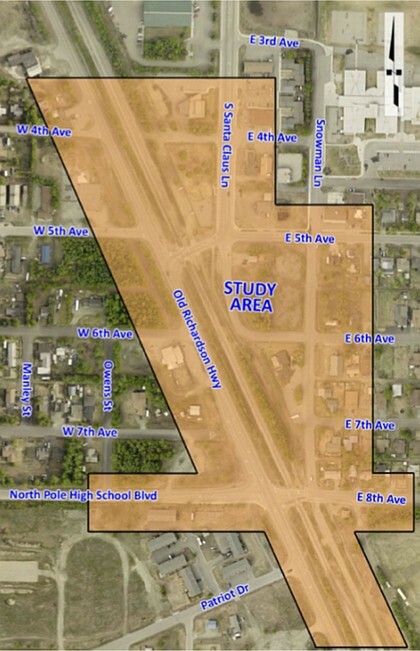 The Alaska Department of Transportation & Public Facilities (ADOT&PF), in cooperation with the Alaska Division of the Federal Highway Administration (FHWA), is analyzing the intersections at Santa Claus Lane and 5th Avenue, and the Old Richardson Highway and North Pole High School Boulevard, in North Pole, Alaska to identify potential problems and possible improvements. Selection of a preferred alternative will occur in early 2019. Design and Right-of-Way acquisition will take place from 2019 through 2020. Construction is anticipated in 2021. Public input is vital to the project and is considered part of the existing conditions data being analyzed. The public is invited to attend an Open House to learn about the project and provide input to help determine the project purpose and need.